Measurements: 2.6 x 4.73 inches, or 67 x 120 mm. Back of card: Four small versions of the 3 of Cups (shown above). These constitute the "panes" of what looks like an old-fashioned window, one with four separate pieces of glass, separated by glazing. The overall color is maroon. May be inverted. Booklet included: Yes, the usual long strip of paper with 14 panes. Each measures 2.6 x 4.73 inches, or 67 x 120 mm. 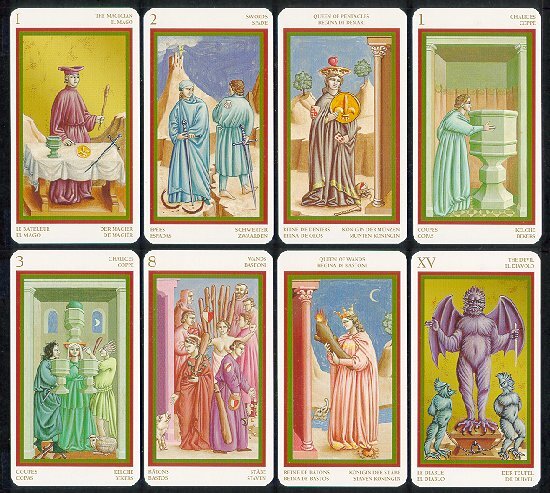 Comments: This deck is based on the art of Giotto di Bondone, 1267-1337. Notes with this deck say, Giotto is considered one of Europe's greatest painters. His work marks the transition from Romanesque to Gothic art, in short heralding those human & expressive values which Humanism took on in later centuries. In particular, Giotto gives medieval art perspective & three-dimensionality which, in addition to being an important technical innovation, radically changes how painting is viewed by breaking away from Byzantine archetypes after centuries & dwelling on the individuality of characters. In most respects, this is a fairly standard deck, with a Marseilles inspired major arcana.